Please join us on Wednesday August 1st for the 2018 Orange Wednesday Ride, a special fundraiser to help promote mental health awareness and to help support families and individuals struggling with mental health. The event includes entertainment, refreshments, a silent auction and an art project. You may also choose to take a 90 minute guided bike or Segway tour highlighting some local talent. Our inaugural Orange Wednesday Ride in 2016 raised over $12,000 and our goal is to exceed that this year. 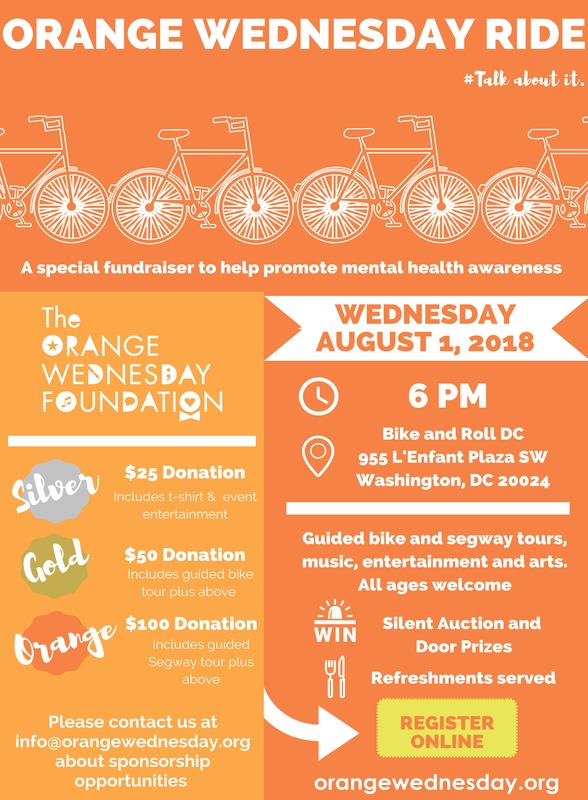 For more information or to donate to the silent auction, please contact OrangewednesdayRide@bikeandrolldc.com. See the Orange Wednesday Ride page for more information. us know if you are interested in participating. The Annual 0.5 Edward Avenue Resolution Run is held on New Year’s Day each year and benefits the Orange Wednesday Foundation.